Current systemic therapies for breast cancer are often limited by their nonspecific mechanism of action, unwanted toxicities on normal tissues, and short-term efficacy due to the emergence of drug resistance. However, identification of the molecular abnormalities in cancer, in particular the key proteins involved in abnormal cell growth, has resulted in development of various signal transduction inhibitor drugs as new treatment strategies against the disease. Protein farnesyltransferase inhibitors (FTIs) were originally designed to target the Ras signal transduction pathway, although it is now clear that several other intracellular proteins are dependent on post-translational farnesylation for their function. Preclinical data revealed that although FTIs inhibit the growth of ras-transformed cells, they are also potent inhibitors of a wide range of cancer cell lines that contain wild-type ras, including breast cancer cells. Additive or synergistic effects were observed when FTIs were combined with cytotoxic agents (in particular the taxanes) or endocrine therapies (tamoxifen). Phase I trials with FTIs have explored different schedules for prolonged administration, and dose-limiting toxicities included myelosuppression, gastrointestinal toxicity and neuropathy. Clinical efficacy against breast cancer was seen for the FTI tipifarnib in a phase II study. Based on promising preclinical data that suggest synergy with taxanes or endocrine therapy, combination clinical studies are now in progress to determine whether FTIs can add further to the efficacy of conventional breast cancer therapies. Farnesyltransferase inhibitors (FTIs), initially developed to target cancers in which the ras proto-oncogene was mutated and overactive, represent a novel form of anticancer therapy. However, in many tumours that lack ras mutations, activation of Ras protein may still occur because of permanent upstream growth factor activity. Breast carcinomas are known to have a very low (< 2%) incidence of ras mutations, and yet aberrant function of the Ras pathway is thought to be common . In transgenic mouse mammary tumours, receptor tyrosine kinase pathways result in activated Ras protein signalling , whereas hormone-sensitive MCF-7 breast cancer cells have been shown to express high levels of Ras-related proteins . Thus, a strategy of targeting Ras protein function in cancer need not limit itself to tumours with proven oncogenic ras mutations. For the Ras protein to become activated it must first associate with the cell membrane, a process that is dependent on prenylation (Fig. 1). Prenylation is the addition of either a farnesyl group or a geranylgeranyl group to a conserved carboxyl-terminal cysteine residue on the Ras protein, a step that can be catalyzed by two different enzymes. 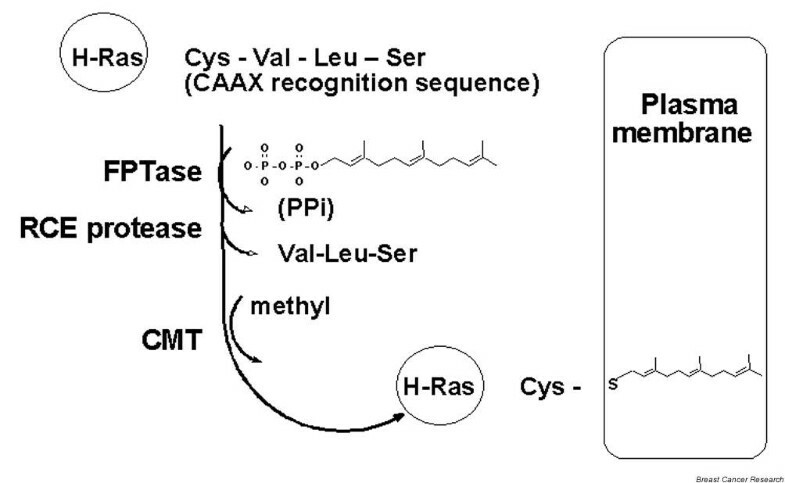 Protein farnesyltransferase enables the transfer of a farnesyl group from farnesyl pyrophosphate to the cysteine residue, and it recognizes a specific sequence of amino acids, the CAAX motif (where C = cysteine, A = aliphatic amino acid, and X = residues such as methionine, serine, leucine, alanine and glutamine). Protein geranylgeranyl transferase (GGPT) type 1 also acts at the CAAX motif, and it is the X residue that determines which enzyme becomes activated . After prenylation the CAAX proteins undergo further processing, the result of which is an increase in the hydrophobic properties of Ras such that it can readily associate with the lipid bilayer of the cell membrane. This enables it to cycle from its inactive GDP-bound state to the active GTP-bound state in response to upstream tyrosine kinase signalling. Ras processing and membrane association: role of farnesy protein transferase (FPTase) and CAAX cleavage. Post-translational modifications of Ras proteins that allow subsequent hydrophobic interaction with the plasma membrane after addition of a 15-carbon farnesyl moiety by the enzyme FPTase. CMT, carboxymethyltransferase; RCE, Ras converting enzyme. One key event resulting from Ras activation is the recruitment of Raf-1 to the cell membrane. Activated Raf-1 then phosphorylates the protein kinases MEK1 and MEK2, which in turn activate mitogen-activated protein kinase/ extracellular signal-related kinase (MAPK/ERK), a sequence of events that results in the transcription of target genes that are involved in cell proliferation . In addition, Ras can activate other cellular effectors independent of Raf-1, such as phosphatidylinositol 3-kinase (PI3-K), which signals via an alternative pathway to influence the suppression of apoptosis ; the protein kinase MEK kinase, which activates the c-jun transcription factor ; and the G proteins Rac and Rho, which are involved in regulation of the cytoskeleton. Despite the fact that there are alternative ways in which prenylation of Ras takes place, farnesylation has attracted most attention because it is critical for oncogenic Ras signalling , and FTIs have been developed as a novel drug therapy to target aberrant Ras function in cancer. One approach to development of FTIs was the rational design of several peptidomimetic compounds based on the CAAX sequence of Ras. Ester prodrugs such as L-744,832 were found to inhibit the growth of more than 70% of tumour cell lines  and significantly inhibited the growth of spontaneous mammary tumours in H-ras transgenic mice without systemic toxicity . Alternative prodrugs such as FTI-277 were synthesized in which the central portion of the CAAX mimetic was replaced by a rigid spacer group . Others combined the properties of a farnesyl disphosphate analogue with those of a peptidomimetic, such as the bisubstrate inhibitor BMS-186511. An alternative approach was high throughput screening of natural products or compound libraries, which led to the discovery of the two unrelated compounds SCH 66336 and R115777, both of which are orally active and in the clinical arena. SCH 66336 (ionafarnib; Sarasar™) is a selective, tricyclic piperidinyl piperidine carboxamide developed by Schering Plough Research, and R115777 (tipifarnib; Zarnestra™) is a methyl quinolone developed by Janssen Research Foundation (now part of Johnson and Johnson Pharmaceutical Research and Development). They are both potent inhibitors of farnesyl transferase at nanomolar concentrations and have shown activity in a variety of human tumour lines and animal models [12, 13]. There are two other compounds of note: BMS-214,662, a selective imidazole-containing tetrahydrobenzodiazepine that came from a series of nonthiol, tetrapeptide Ras FTIs developed by Bristol Myers Squibb ; and L-778,123, a peptidomimetic from Merck & Co Incorporated . Experiments characterizing the sensitivity of various human tumour cell lines to FTIs were pivotal because they showed that the sensitivity did not correlate with the presence of oncogenic ras mutations . Indeed, breast cancer cells that lacked ras mutations but had active protein kinases, in which the transformed phenotype may depend on upstream activation of Ras protein, were especially sensitive to the drugs. Another important initial observation was that many of the cellular effects of FTIs appeared to be cytostatic rather than cytotoxic and that, after removal of FTI from the culture medium, cells reverted to their transformed phenotype . Several lines of in vitro and xenograft data supported the cytostatic effect by showing that FTIs induced either a G1 or G2/M cell cycle arrest [17, 18]. In hormone-sensitive, oestrogen receptor (ER)-positive MCF-7 breast cancer xenografts, the FTI R115777 appeared cytostatic on tumour growth in vivo (Fig. 2), but analysis of FTI-treated xenografts revealed a significant fall in cell proliferation index (Ki-67) and induction of the cdk inhibitor p21cip1/waf1, together with a twofold rise in apoptotic scores . Dose-related effects of the farnesyltransferase inhibitor tipifranib on the growth of oestrogen receptor-positive MCF-7 breast cancer xenografts. Reproduced with permission from Kelland and coworkers 19. Various conditions in which other cell survival pathways are modulated may determine whether FTIs have a cytotoxic or proapoptotic effect. For example, activation of the PI3-K/Akt pathway (which can be Ras-independent) prevented the FTI L-744,832 from inducing apoptosis in ras-transformed fibroblasts . However, inhibiting this pathway with the PI3-K inhibitor LY-294002 or depriving the cells of serum (which normally promotes cell survival through cytokine/insulin mediated activation of Akt) allowed L-744,832 to induce significant apoptosis in these cells. Thus, FTIs may appear cytostatic in some systems because of activation or over-expression of alternative cell survival pathways, some of which may be independent of Ras. As such, combinations of an FTI with other pathway inhibitors might be a rational approach to maximizing the effect of these compounds. As discussed below, this concept was developed in breast cancer by combining FTIs with tamoxifen, an endocrine agent that is well known to modulate cell survival in ER-positive breast cancer cells. As FTIs have been developed, controversy has continued to surround exactly which farnesylated proteins are the key targets for the anticancer effect of these agents. Although FTIs clearly inhibit Ras farnesylation, it is unclear whether their antiproliferative effects result exclusively from their inhibition of Ras functioning . For example, it has been shown that centromere binding protein (CENP)-E and CENP-F, which are preferentially expressed in mitotic cells, are direct substrates for FTIs, and that their prenylation can be inhibited by the FTI SCH 66336 . Other intracellular targets for FTIs include perioxomal membrane  and nuclear membrane (lamin A and B) associated proteins , or an effect on the PI3-K/Akt cell survival pathway . FTIs also inhibit soft agar growth of several breast cancer cell lines independent of their mutant Ras status , probably through an alternative target such as the 21 kDa protein RhoB, which regulates receptor trafficking and cell adhesion/motility . In total, more than 100 polypeptides possess a CAAX sequence that potentially can be farnesylated, and as such FTIs may have multiple targets that may be inhibited to produce a net anticancer effect . In addition to in vitro and in vivo preclinical evidence that breast cancer cells may be growth inhibited by FTIs, emerging data suggest that FTIs could enhance the efficacy of several conventional therapies for breast cancer. A series of combination experiments were performed with ras wild-type breast cancer cells, examining the effects of the FTI L-744,832 in combination with various cytotoxic drugs, including doxorubicin, cisplatin, vinblastine, 5-fluorouracil and paclitaxel. Although the effects on growth inhibition for FTI plus most of these agents were merely additive, the combination of L-744,832 with paclitaxel was clearly synergistic . These findings have been supported by preclinical studies with both tipifarnib and lonafranib in combination with paclitaxel [29, 30]. Indeed, in wap-ras transgenic mice, which develop spontaneous mammary tumours that are resistant to paclitaxel, lonafarnib was able to overcome resistance . The finding that lonafarnib prevents farnesylation of CENP-E and CENP-F raises the possibility that FTIs may inhibit microtubule formation, resulting in cells accumulating in the G2/M phase of the cell cycle, which in turn may lead to enhanced sensitivity to the microtubule stabilizing action of the taxanes. Several clinical trails have been initiated to explore the combination of FTIs with taxane-based chemotherapy (see below). Perhaps greater interest has surrounded the potential of combinations of FTIs with endocrine agents, in particular whether they can overcome or prevent the endocrine resistance that can develop during prolonged therapy with either tamoxifen or aromatase inhibitors. It has become clear that ER signalling and growth factor pathways crosstalk to modulate endocrine response in breast cancer cells during prolonged therapy . This crosstalk can occur at a number of levels, including the type-1 tyrosine kinase growth factor family (epidermal growth factor receptor and HER2)  and the PI3K/Akt pathway  interacting directly to activate ER signalling, with evidence that these pathways become upregulated or activated during the development of endocrine resistance . At least four independent groups, using both in vitro and in vivo experimental models, have now shown that various signal transduction inhibitors (i.e. tyrosine kinase inhibitors and MEK inhibitors) can treat or even prevent endocrine-resistant growth [35–38]. For example, in hormone-sensitive MCF-7 breast cancer cells, combined treatment with the tyrosine kinase inhibitor gefitinib and the endocrine agent tamoxifen was more effective than either treatment alone, with greater antiproliferative/proapoptotic effects and near complete inhibition of phosphorylated ERK1/2 MAPK and Akt . This resulted in greater G0/G1 arrest and suppression of the cell survival protein bcl-2 than are observed with just tamoxifen, promoting the novel concept in breast cancer that combined signal transduction inhibitor/endocrine therapy may be considerably more effective that endocrine therapy alone . Similar data have now emerged that support the combination of FTIs with endocrine therapy in breast cancer. In vivo, tipifarnib produced a modest cytostatic effect on MCF-7 xenograft growth, with evidence of induction of apoptosis and enhanced expression of the cell-cycle inhibitory protein p21 . In contrast, when tipifarnib was combined with tamoxifen or oestrogen deprivation therapy, combined treatment induced significantly greater tumour regression as compared with either therapy alone . The mechanism underlying any interaction of FTIs with endocrine therapy remains unclear. Analysis of the excized xenografts revealed significantly lower cell proliferation (Ki-67 scores), without any enhanced apoptosis. Three other groups also reported a similar interaction for FTIs with tamoxifen or aromatase inhibitors, and suggested either a synergistic  or an additive antitumour effect . One recent study implied an additive effect on G0/G1 cell cycle arrest, and that FTI-277, when combined with tamoxifen, maintained higher levels of the Cdk inhibitor p21waf/cip1, resulting in an additive effect on inactivation of cyclin E/Cdk2 complexes and decreased phosphorylation of pRb . Whether the effect seen in these studies represents true synergy is sometimes unclear because formal mathematical methods of analysis have not always been employed. However, these emerging data have led to the initiation of several clinical trials in breast cancer to investigate the combination of an FTI with endocrine therapy (see below). A number of phase I studies have been published over the past 3 years in a variety of solid tumours. Initial studies targeted solid tumours with Ras mutations (e.g. colorectal and pancreatic carcinomas [44, 45]). Unfortunately, these studies failed to show evidence of efficacy, which might be explained in part by mutations in the K-Ras protein, which can be alternatively prenylated by GGPT-1 and therefore be resistant to FTIs. L-788,123 has recently been shown to inhibit both protein farnesyltransferase and GGPT-1 in a phase I trial , and dual inhibitors of this kind may ultimately prove to be more efficacious in K-Ras mutated tumours. In phase I studies, dose-limiting toxicities included myelosuppression, gastrointestinal toxicity, peripheral neuropathy and fatigue. However, it became clear that the dosing schedule was as important for toxicity as dose. For example, twice daily SCH66336 300–400 mg, given intermittently, was well tolerated , but severe toxicity emerged when the same dose was given in a continuous regimen . Similar results were found when using R115777; an intermittent schedule at doses of 300 mg or less twice daily produced infrequent toxicity as compared with continuous dosing, and could be administered for more than 6 months using a 21/28 day schedule, provided the twice daily dose did not exceed 240 mg/m2 . To date, only one phase II trial has been reported in patients with breast cancer . Seventy-six patients with advanced breast cancer were treated with tipifarnib using either a continuous dose of 300 or 400 mg twice daily (n = 41) or an intermittent dose of 300 mg twice daily for 21 days followed by 7 days of rest (n = 35). In the continuous dose treatment arm there were four partial responses (10%) lasting between 4 and 12 months and six patients with stable disease (15%) for at least 6 months. In the intermittent dose treatment arm there were five partial responses (14%) and three patients with stable disease (9%). All primary tumours were assessed for ras mutations but only one tumour was found to have such a mutation, which is consistent with previously published data indicating that breast carcinomas contain a low frequency of ras mutations . Clinical efficacy was also independent of ER/progesterone receptor status, but six out of nine patients who responded to R115777 had tumours that were HER2/neu positive. The main toxicities were neutropaenia, thrombocytopaenia, neurotoxicity and fatigue. The incidence of grade 3 toxicity or greater was significantly less with the intermittent dosing schedule (continuous dose versus intermittent dose): neutropaenia 43% versus 14%, thrombocytopaenia 9% versus 3%, and neuropathy 12% versus 0%. Thus, although clinical efficacy was similar between patients treated intermittently and those receiving continuous dosing, the side effect profile was significantly improved by using an intermittent schedule. The conclusions of the phase II study were that in breast cancer in which wild-type ras may be driven by upstream growth factor over-expression, FTIs exhibited activity and were well tolerated. Based on encouraging preclinical data outlined above suggesting synergy, there have been a number of published phase I studies of FTIs in combination with chemotherapy agents used in breast cancer (for review ). Lonafarnib, tipifarnib and BMS-214,662 have all been combined with taxanes, whereas lonafarnib and tipifarnib have also been combined with cisplatin or carboplatin, with myelosuppression and gastrointestinal effects being dose-limiting toxicities. In patients with taxane-resistant non-small-cell lung cancer, partial responses were seen when paclitaxel was combined with the FTI lonafarnib . In addition, tipifarnib has been studied in combination with capecitabine, 5-fluorouracil and herceptin, which are all established treatments for metastatic breast cancer. Toxicities were predictable and manageable, with no pharmacokinetic interactions between the drugs and evidence of clinical activity that was considered encouraging. In a study examining the combination of tipifarnib with docetaxel, one complete response, seven partial responses and six patients with stable disease were recorded . In the combination study looking at capecitabine , eight patients had stable disease after four courses of treatment, and one patient with melanoma had stable disease after 12 courses. Partial responses were seen in other solid tumours, including breast cancer. To date there are no published phase II combination studies using FTIs and cytotoxics in breast cancer, although studies in combination with taxanes are in progress. A number of small phase I/II trials have been initiated with FTIs in combination with endocrine therapies, including tamoxifen, fulvestrant, or an aromatase inhibitor (Table 1). Some of these trials are in the post-tamoxifen setting, with at least one trial enrolling patients whose tumor is progressing on tamoxifen, and then adding the FTI tipifarnib to determine whether clinical responses can be observed and resistance reversed. It is unlikely that any overlapping toxicities will be seen for combinations of FTIs with endocrine therapy, although it is important to ensure that no pharmacokinetic interactions exist whereby tamoxifen or aromatase inhibitor induced hepatic enzymes could enhance clearance of FTIs and lower serum concentrations. Recently, pharmacokinetic and pharmacodynamic end-points were assessed using a sequential design in 11 patients ; they were treated initially with the FTI tipifarnib (either 200 mg twice daily or 300 mg twice daily for 21/28 days), and after 1 week tamoxifen was added. There was no significant change in the pharmacokinetic profile for tipifarnib. 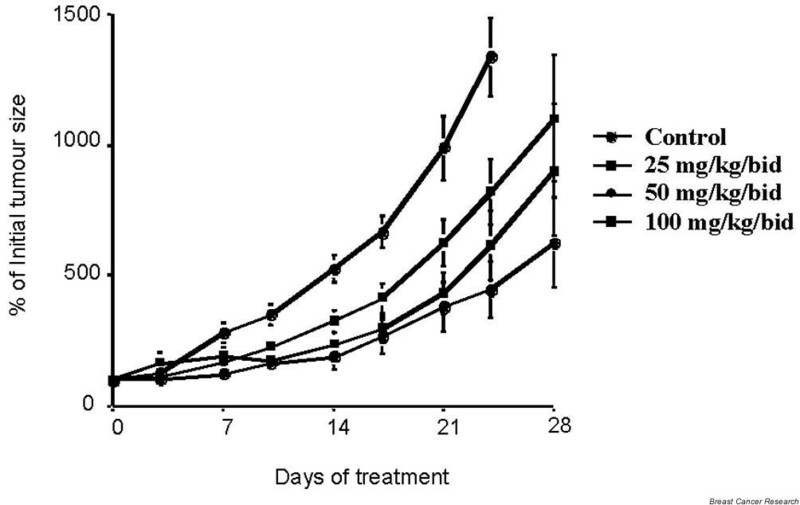 Moreover, the pharmacodynamic end-point (inhibition of farnesyltransferase in peripheral blood mononuclear cells) was enhanced from 30% enzyme suppression to 41% by the combination. In addition, such trials may help to determine the optimal schedule for the combination. CBR, clinical benefit rate; ORR, objective response rate; PK/PD, pharmacokinetic/pharmacodynamic. The ultimate clinical test for the hypothesis that FTIs enhance the efficacy of endocrine therapy is the randomized controlled clinical trial. The primary end-point for these trials is to investigate whether time to disease progression can be significantly prolonged by the addition of an FTI to endocrine therapy, thus delaying the emergence of resistance, as demonstrated in various preclinical models described above. Table 2 lists the current randomized, controlled clinical trials of endocrine therapy with or without FTIs in advanced breast cancer. The majority are placebo-controlled, double-blind, randomized phase II studies including only 100–200 patients, and in several studies the primary efficacy endpoint is objective response rate rather than time to disease progression. In the first-line ER-positive setting, such studies are examining whethter the combination can provide greater initial antitumour activity than endocrine therapy alone, thereby enhancing the response in tumours with de novo endocrine resistance. Given the mechanism of action of these drugs in combination (i.e. enhanced G0/G1 arrest without enhanced apoptosis), an enhanced clinical benefit rate that includes an assessment of stable disease may be a better end-point for such randomized phase II trials, especially if FTIs ultimately contribute to prolonged control of the disease. FTIs have shown promise in early preclinical and clinical studies as a novel anticancer agent for breast cancer. Although their true mechanism of action remains unclear, ongoing clinical trails are assessing their potential to enhance the efficacy of current endocrine and cytotoxic therapies in breast cancer. Combinations with other signal transduction inhibitors may be an additional strategy that merits further research. This article is the third in a review series on New targets for therapy in breast cancer, edited by Stephen RD Johnston. JH and SRDJ have received research support from Johnson & Johnson Pharmaceutical Research and Development. SRDJ has been on the speaker bureau for Johnson & Johnson Pharmaceutical Research and Development and Schering Plough.